One of the key things to consider to Master Your Money is how much income you are bringing in. One of the biggest mistakes I see people make is they become asset rich and income poor, simply by building their asset base and neglecting the income they generate from these investments. This often occurs with farmers who often own multi-million dollar farms but are unable to generate a sufficient income from the farm to meet their living expenses. Is it $500,000? Is it $1,000,000? Is it $2,000,000? Unfortunately this is the wrong question. You shouldn’t ask how much I need to save to be financially free, you should ask how much INCOME do you need each year to be financially free? Is it $40,000 per annum (which equates to a modest lifestyle)? Is it $60,000 per annum (which equates to a comfortable lifestyle)? Is it $80,000 per annum (which equates to an extravagant lifestyle in retirement)? (If the above don’t sound like much, look at your current budget and remove your mortgage and any other debt repayments and also your children’s school fees. This is your lifestyle expenses and for most people they are generally between $40,000 and $60,000 per annum). The key to financial freedom is not your net worth or capital, it is your income that you generate each year which will determine what lifestyle you lead both now and in retirement. In order to Master Your Money, you need to Master Your Income. One of the keys to Mastering Your Income is understanding what I refer to the LEAP graph. 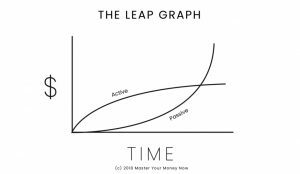 The LEAP graph stands for Logarithmic, Exponential, Active, Passive graph. Huh? Wasn’t this something my Year 10 Maths teacher taught me which had absolutely no practical application to my life whatsoever? But this is where I want to go back and make a practical application of what your Year 10 Maths teacher taught you. Firstly, because I am a numbers nerd! But secondly, if you understand the power of this you will focus your energy on what really matters and accelerate the point where you are able to achieve financial freedom. L = Logarithmic refers to a logarithmic scale which if drawn on a graph increases quickly and then flattens out over the long term. E = Exponential refers to an exponential scale which if drawn on a graph stays flat at the start but then turns upwards and increases almost vertically over the long term. A = Refers to Active Income and it is linked to the logarithmic scale. Active income is the income you physically have to be present to generate, such as a salary or self-employed income. What you will find is your salary increases quite quickly as you gain more qualifications and experience, but there is a point where it plateaus and remains the same. For example, the pay rise that a teacher would receive in the first few years would be quite substantial. However, after they reach the top pay grade (after ten years) they will only receive small pay rises linked with inflation. A teacher literally cannot earn any more at this point unless they seek a leadership position. Their annual income will plateau at this point. P = Refers to Passive Income and is linked to the exponential scale. Passive income is income generated “while you are asleep” where you spend little to no work to generate. This is primarily investment income from property (rent), shares (dividends) or business (where you are not required to be present in the business at all times). The thing with passive income is that it is really hard to get started! It requires you to save and invest in assets, often starting very small and generating small returns at the start. At this point it can be quite demoralising to see the small returns on these investments and a lot of people quit at this time. But over the long term, your passive income will grow substantially to a point where it will replace your current income and/or cover your expenses so you can be financially free. Most of all, there is no limit to the amount of passive income you can generate. So where do you think Masters of Income spend their time, growing their Active income (which has a limit) or Passive income (which has no limits)? Passive income of course. It is only passive income which will make you financially free. It is only passive income which will enable you to provide for your family and support the causes that are important to you. It is only passive that will enable you to be financially free so you can make decisions based on what you want to do, rather than what your bank account will enable you to do. Does this mean you should quit your job tomorrow to focus on your passive income? Absolutely not, because the quicker you can build your active income the more cashflow you will have to invest in assets which will generate passive income. The best investors and business owners I know remained in their jobs until their active income hit their ceiling, then they took the LEAP to focus on their passive income. Ultimately the earlier you focus on building your passive income, the earlier you can live the life you want to live. If you have never had a conversation about building passive income, I would strongly recommend speaking to an independent financial planner to develop a plan that works best for your circumstances. In addition, you can surround yourself with people who are on the same journey with you who can encourage you along the way.